Imagine…being Kurdish. Imagine the horrors of your history – a universally unwanted people, subject to endless persecution at the hands of Turks and Arabs. Imagine being mass murdered by mustard gas, used by a Ba’athist government, to deplete your villages of life. Imagine centuries of restlessness, fear, roaming the world, looking for a place to rest. Imagine – after an American led invasion – you are left with most of Northern Iraq populated with Kurds, protected by American interests in the region, and the moral and political authority to finally, after decades, nay, centuries, envision your dream: an independent “Kurdistan”. Imagine you are Massoud Barzani. Your father before you dedicated his life for “Kurdistan”. It is now your turn to fulfill your nationalist duty. This is your opportunity, in this chaotic Iraq, to finally have borders, protect your people from the Arabs and the Turks – to finally realize “Kurdistan”. But how would you do it? Let’s take a journey toward “Kurdistan”: let’s get rich, let’s get borders, let’s get allies, and let’s rid ourselves of enemies. The way to begin is simple: message. With millions of dollars in Iraqi oil money, and the U.S. as an ally, you begin with one word: “Kurdistan”. And you repeat it – to journalists, in magazines, in official documents, in normal, every day conversation. You refer to “Kurdistan” as if it exists. Eventually, “Kurdistan” will conjure up an image in everyone’s mind – Northern Iraq. It will become, at least psychologically, the land of the Kurds. You have successfully planted the first seed. Now, you must identify the obstacles: The sheer number of Kurds in Iraq is a bonus – and protection under the new Iraqi constitution protects Kurdish claims to the (Assyrian) lands…however, the Assyrians still actually live on their ancient territory, and they are claiming the land as their own. An ethnically and religiously distinct group of people who, in truth, predate Kurds in every single square inch of what is being called “Kurdistan”, are still around, have formed political parties, and are voicing their request for independence in areas Kurds want to incorporate into “Kurdistan”. What is the Kurdish Regional Government to do? After all, if Kurds are claiming this land – can’t the Assyrians just as well? Of course they can. After all, every square inch of what Kurds call “Kurdistan”, from millennia ago, was originally Assyria. Unfortunately for Massoud Barzani, Assyrians are still there. Making a fuss. Demanding recognition that they, too, have been for millennia living at the mercy of Arabs, Turks, and Kurds. They are, quite simply, the indigenous people. So, if you were Massoud Barzani, the best to do in this situation is offer doublespeak; extend one hand in apparent cooperation while working stealthily to destroy ethnic identity with the other. If you were Barzani, would you care if these people were Christian? No, their religious affiliation is incidental. Would you care that they are ethnically the indigenous people of what you want to be “Kurdistan”? Absolutely. After all, they can make waves in the otherwise calm waters on the way to an independent “Kurdistan” – also known as, Assyria. So begins the process for raising “Kurdistan” from the ashes – fierce propaganda from one side, divide and conquer from the other. You would begin writing about “ancient Kurdistan”, marginalizing the existence and importance of the Assyrians, who have been in the region for almost 7000 years. You would begin, slowly, claiming indigenous ties to the area. You would welcome U.S. troops, knowing U.S. policy was fully on the side of your future “Kurdistan”, and little would be done to take Assyrians seriously. When the elections finally came – you would encourage voter intimidation of the Assyrians and voter fraud to increase Kurdish representation in the cities we want. You would promote parties like Mr. Afram’s “Chaldean Democratic Union”, so that you can advance the idea that Chaldeans and Assyrians are ethnically different, causing rift, argument, and discord among this ancient nation. More importantly, you would consistently try to capitalize on the Western belief that Kurds are secular Muslims, while simultaneously ignoring and concealing the abduction of Assyrian girls from their villages, forcing them into Islam and marriages to Muslims. Murder, beheadings, mutilations, and the burning of Assyrian civilians would go unpunished, and unchecked by the Western allies. In order to ultimately “Kurdify” the Assyrians, you would eye the churches, pushing for “Christian” identity rather than “Assyrian” identity. What could be better for the future stability of “Kurdistan” than encouraging betrayal to a 7,000-year-old ethnicity? If the Assyrian minority begins allying with their churches and church leaders - identifying only as “Christians” - instead of allying with their political representatives - and identifying as “Assyrians” - eventually, with enough time, the idea of “Assyrian” will be lost. Ultimately, the ancient language will be lost. They will dwindle in numbers. They will forget their history, their martyrs, they will cling to their religious leaders and forget the Agha Petrouses, the David Perleys, and the Yusef Maleks, who fought and gave their lives for Assyria. Instead, these Christians will ultimately be content with becoming, ever so slowly, “Kurdish Christians”. Indeed, if you were Massoud Barzani, you would ensure the ultimate memory loss of the Assyrians, these ancient people, by supporting their churches, and ignoring – to the point of utter disrespect – their political representatives. You would build great monuments to their God and allow basic city infrastructures to ruin. You would fund Christian religious leaders while allowing roads to go unmended, schools to crumble, and bridges to collapse. If Zowaa builds a community center – then “Kurdistan” will build a bigger one next door! And at long last, after all of this is accomplished, you would sit back and watch these people bicker amongst themselves, unraveling in disunity, doing your job for you. Much like the American divide between the republicans are democrats, you would watch as these people attack each other according to their affiliations – Mar Bawai? Or Mar Dinkha? Zowaa? Or Bet-Nahrain? Friends will become enemies, husbands will turn on their wives, and priests will forsake their parishioners. The Assyrians will spend years arguing, as to what their actual name is – Chaldo-Assyrian? Syriac? Assyrian? You would truly enjoy yourself, as your vision of a united “Kurdistan” became clearer, stronger, while these people busied themselves with discrediting each other, attacking each other, and choosing loyalties based on jealousy, competitiveness, religious and political affiliations, rather than what is truly best for the nation as a whole. And you will continue - dividing and conquering, dividing, and conquering…while the Kurds are uniting. For “Kurdistan”? That is what you would do, if you were Massoud Barzani. General Sada is quite an amazing man. There was a time in my life as an Air Force pilot back in the first Gulf War, we were looking out of my cockpit window, on my radar, into Iraqi airspace. General Sada was my enemy. I thought at that time the Iraqis were our enemies. I can tell you that, having spent this past summer in Iraq, talking to our soldiers and to the Iraqi people themselves, that our enemy was Saddam Hussein. The Iraqi people are our best friends and our best allies right now. What we are doing, not only for them but for ourselves, really, is building a tremendous bond and allowing the Iraqi citizens to rise up and have their own self-determination, their own freedom, their own peace, and dictate their own future, apart and away from Saddam Hussein. General Sada is an Air Force pilot in the Iraqi Air Force. He’s flown 39 different types of airplanes, which is amazing. The first and only, I believe, Iraqi Air Force pilot to come to the U.S., in the 1960s, to Randolph Air Force Base and get his instrument flying training from the U.S. Air Force back in the early 1960s. He has a book out, which I think is a tremendous read. If you have not picked it up yet, you need to. 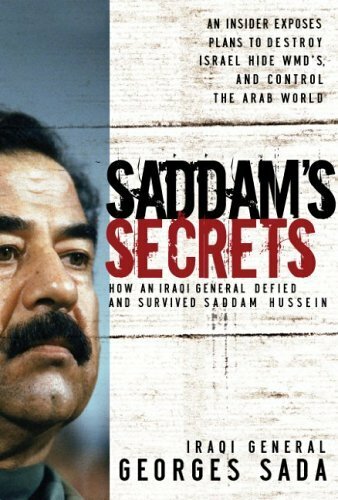 Not only is it a personal tale of a man and a Christian in a very un-Christianlike atmosphere in Iraq, but also a man who will give you the insight into Saddam Hussein, what we thought to be true and what some of us knew to be true. General Sada nails it in terms of what was going on in Saddam’s mind, the evil nature of that man and the fact that there were WMDs, which they moved. All of us who have believed us all along are very happy to hear General Sada pass that on and confirm what we’ve always suspected. Currently he still lives in Baghdad. He’s the Iraqi Institute for Peace President/Director. He’s also one of the senior advisors to Prime Minister Allawi as well. He’s a tremendous man and I think an Iraqi patriot. General Georges Sada. It’s a great honor for me to be between you and I hope my poor English will help me to explain myself to you and then to make myself clear. I was thinking how to do this, in the short time that we have. But I think I will only speak to you some minutes. I will make some briefs on the subjects and invite whatever questions you would like to ask. Whether they have to do with military, political, or religious issues and anything having to do with the ethnics in Iraq, I am ready to answer them. This will make the discussion much better because I don’t know what you want to ask and which subject you want to talk about. I belong to a country in which it is very deep in 7,000 years of history. So when you talk here about 100, 200 or 300 years of history, for Iraqis this is very funny, you know, because we talk about 3,000, 4,000 and 5,000 years always. That’s why we will give you the chance to ask questions. I still start with Iraq as the land of Father Abraham and Iraq as the land of Daniel. Of course, most of you know about Daniel in Babylon with Nebuchadnezzar. Then there is Iraq as the country of where Jonah came to Nineveh, which was the capital of the Assyrian Empire. I am very proud that to be descended from the Assyrians and that I am a Christian Assyrian from Nineveh. I am happy about that. Iraq became a Christian country when Saint Thomas, one of the 12 disciples, came trough on his way to India to evangelize. He came during the first 45-50 years in the first century, and the Assyrians met him and they believed in Jesus Christ from that time in the 1st century. Then he left to India to evangelize, where he died. After him, from the 72 disciples, Saint Aday [ph] came in the year 79, also in the 1st century. The first churches in Iraq were built in the 1st century. The Assyrians were Christians since the 1st century and I belong to those people. We are until now keeping our faith and we have been Christians, although the country was taken by the Muslim Arabs in 634 A.C. and since then, Iraq has been a Muslim Arab country. But we were have still been living there, keeping our faith in the mountains. Mainly the Assyrians were in the north of Iraq around Nineveh, the area you Americans know as Kurdistan, the three provinces and the northern part of Iraq, which is Erbil, Dhok and Sulaimaniyah, where the Kurds are trying to have their free federal but in one Iraqi country. About myself, I’ll tell you that I joined the Air Academy in 1958. I was trained in Russia for four years and then, after that, I came back to Iraq. I flew the fighter aircrafts, the MiGs. In 1964, we had an exam in Turkey, seven guys, because Americans gave one seat for pilot instrument instructors to fly people at night in bad weather and instrument flying. They wanted the qualified people from Iraq, but only one man. So we took the exam and thank God I was number 1, so I came to Texas, Randolph Air Force Base, in Lackland, in 1964. I was trained as an instructor for bad weather, night and instrument flying. I came back home and then I did a lot of work in the fighter squadrons. I served in the Air Force for about 40 years. I was retired in 1986 as two-star general. I was supposed to be promoted to three-star, but the Baath Party and the intelligence sent for me. They said, “You are the only general in this country who is not being a Baath Party member. So now a this time we will not invite you to come because we have been inviting you for 30 years and you didn’t accept it. So now, tell us why you are not becoming a member of the Baath Party?” I said, “You want the truth?” and they said, “yes.” I said, “You see, because in your ideology of the Baath Party, you say the body of the nation is Arab and the spirit of the nation is Islam. Therefore, I don’t fit in two ways. I don’t fit in the body because you are Arab and I am Assyrian. I don’t fit in the spirit because you are Islamic and I am a Christian. And I want to keep both of them, my nationality and my faith. And because of that, I don’t want to block you. I don’t want to block myself to get to this party because it doesn’t fit me.” They were very surprised. So they said, “Okay, General Georges, it’s like this: no three-star general and no Air Force Commander.” Because at that time, I was number two and, of course, well, it’s a shame, I would say, people know it. I was the only man who was trained in Russia, America, England and France. And I had taught in three colleges: staff college, war college and national defense college for ten years. Really, I am very proud of my training in America. I will never forget this country because it was really a blessed country and they have taught me a lot and I can tell you, I am very faithful for that. So I was forced to retire in 1986. But when Saddam invaded Kuwait on August 2, 1990, I was the first man who was recalled for active duty. They told him, “Sir, this man is not a party member.” He said, “Yes, I know, but I want him. Bring him.” So I came, I met him. He said, “You are going to be the senior advisor for me on the Air Force, on the Armed Forces.” I said, “Okay, sir. Thank you.” So I was put there. I was given three tasks to do. He knows why he gave it to me because I was to teach these things in three colleges. These three tasks were: what is the capability of the enemy air forces? This means the collegian air forces, including America. Then, what is the capability of five aircraft carriers that are in Red Sea and Gulf? And finally what is the capability of destruction and accuracy of cruise missiles? So these three duties were given to me. I was very happy. I told him, “Sir, this duty is my daily bread. I used to teach it everywhere and I will start working.” I made three beautiful files for it and I started to tell him and the minister of defense and chief of staff and all the others. But unfortunately, nobody was listening. The last meeting was on January 12, 1991. There was a presentation because the deadline of United Nations was going to finish on January 15, 1991, as you know. There were only two or three days to prepare for war. So I was sitting in the war room and we started doing the presentation. Everybody was there, except Saddam. He was listening somewhere else to what was going on. Here I had to stop them. I said, “Excuse me.” The minister of defense said, “Yes, Georges, do you have anything?” I said, “Yes, I have got many things. I don’t agree with this presentation. It’s not going to be like this.” They said, “Do you have another idea?” I said, “Yes, and my idea is 180 degrees different.” He was surprised. I told them, “The supreme commander has given me these three tasks to do, so please I am the one who should do the presentation. Will you permit me to do the presentation?” Then, they could not say no. I continued speaking about what an aircraft carrier is because, ladies and gentlemen, I understood that they thought an aircraft carrier is a fishing boat. I explained to them what an aircraft carrier is, what it can do, how many aircraft are there on deck and what are the three classes of aircraft carriers. I explained everything. Again, the chief of staff said, “Don’t you think you are exaggerating very much about what America can do?” I said, “No, sorry, I’m not exaggerating. But this is according to the paper given to me. But, remember, Americans can do even more than this.” Nobody listened. Then at last there was a question. They said, “Okay, if it’s like this, what’s the solution? What’s your solution?” I said, “My solution is very easy. We have sent our forces to Kuwait by a paper and by same paper we can make them to withdraw from Kuwait and come back. Because President Bush and United Nation are asking the Iraqi forces to get out of Kuwait. This is the only solution left. Today is January 12, 1991. Please I beg you to listen to me.” I really meant I begged, because I knew what was going to happen to my nation. You know what their answer to me was? “If you speak again of pulling the Iraqi forces from Kuwait, your head will be separated from your body.” I said, “Okay, thank you very much. I am advisor and I must be faithful.” I told them all this, but nobody listened. Then, on January 17, the war started. Let me tell you where I was. General Hanz-am had an apartment in the operation room. It was the only apartment in operation room, next to the nuclear weapon room. It has walls and ceilings made of reinforced concrete 3 meters thick. General Hanz-am was my student, I had been his instructor and his commander. In the air force, we love our instructors and commanders. I had flown General Hanz-am solo and many other times, which he remembers. So he insisted on giving me the use of his apartment out of respect. I tried to refuse, because the apartment is for the use of the air force commander, but he insisted from his heart that I was the man who deserved to be there. I went to sleep at 1:00 in the morning. I don’t know what woke me up, but I looked at my watch and saw it was 2:30. I thought, “My God, I was supposed to sleep until 7:00 at least.” I wondered what made me wake up at this time? So I decided to go and see Colonel Ban-am, who’s another Christian, and in command of the radars and radio in the operation room. So I went into the corridor and this is when the ground started shaking. I knew then that the attack had started. The lights started going out and water running everywhere. I went back to my apartment and I had to force the door open. I looked at my bed. It had been flattened to the ground by huge concrete blocks. I had missed being flattened by only 17 seconds. I thought, “My God, who woke me up in time to escape this?” When the first American rocket hit the operation room, it hit the apartment of the air force commander. But I said, “Look, if you are going to send these airplanes, remember, very, very little of them will be back.” He said, “I will send them.” He sent 18 aircraft, the best aircraft we have, to intercept the American aircraft which were attacking. Most of them were destroyed, some on the runway, some just after take off, some as they were climbing, Then they realized their mistake. You see, there are some people who live in the mishap and there are some people who live in the “prehap,” before the things happen. So let us always live in the “prehap,” before the thing happens. Because after it happens, I think then it will be too late. 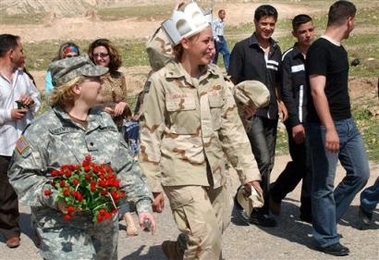 American soldiers take part in commemorations marking the ancient Babylonian New Year Saturday on April 1, 2006, outside Mosul, Iraq about 360 kilometers (225 miles) northwest of Baghdad. (AP Photo / Mohammed Ibrahim). He said, “Okay, I need one pilot to be responsible for the prisoner of war.” Then he came to me and said, “I want a man knows the tactics, offensive and defensive, and who speaks English. Georges, you are the one who will be responsible for the pilots.” I said, “Okay, Sir. My pleasure.” I told them to send the pilots. I am sure the Americans are very good pilots, but remember, even a good swimmer may sink in the sea and even a very good pilot, he may be shot down in the war. So many good American pilots were shot down: F18s, F15s, F16s, Thunderbolts. Many pilots were shot down. At the last, I had 44 of them: 31 or 32 were Americans. The others were Saudis, Kuwaitis, British and Italians. I was responsible for them. I received orders to execute them on January 24 from the president through his son Qusay, who came to me in the operation room. But believe me, I was doing this for two reasons. One was my faith in Jesus Christ and to make Him happy as His son. The second, because I am a high-ranking officer, I have experience, and I was not a Baath Party, to do what they like. I wanted to behave as an Iraqi general, loyal to this country and this country’s deep history, should behave. He left and the next day, people came from the Republican Guard, special guards and said “Come with us.” I knew that the time had come but it was okay. I had done my duty in the best way and my thought was, “let happen what happens.” They took me and they put me in prison. On February 5, I was released because Saddam himself said, “I don’t want to see his face. I don’t want him to be in the Army anymore. But you can’t kill him because he was right.” That is the only thing that saved me and the only reason I am alive now here. Because even thought he was a dictator and evil, he realized the truth of what I had said about a new war between America and his family. Once again I was dismissed from the Army and I have stayed safe until now. I told him, “Sir there will be disaster in the region. The four countries are going to be completely destroyed. Please, please, sir, let us not do that.” I begged him. He started asking me questions and the discussion lasted one hour, 41 minutes. At last, thank God, this attack didn’t happen. This talk took place on December 17, 1990. He said, “Look, if one American rocket will hit the Iraqi lands, I want these 98 aircraft to go and destroy Israel, and the 12 divisions to go in Saudi Arabia and destroy all the industrial area of Saudi Arabia from Kuwait to al-Daran [ph].” Another big, big job, given to the army and you can just imagine 12 divisions destroying all the industrial area of Saudi Arabia and open sky without air defense for them. I understood what was going to happen to these 12 divisions. But this man was not thinking at all what would happen to the forces. I will keep it for your questions but I will tell you about Saddam. He is the man who killed more clerics from Sunni and Shia in the history of Iraq. He is the man who killed more Baath Party members, starting from central command, since the party was founded in 1947. Saddam is the man who killed more of his own people. Saddam is the man who killed more Tikritis, his own cousins from his city, than anyone since Iraq was founded in 1920. Saddam is the one who killed more Kurds. 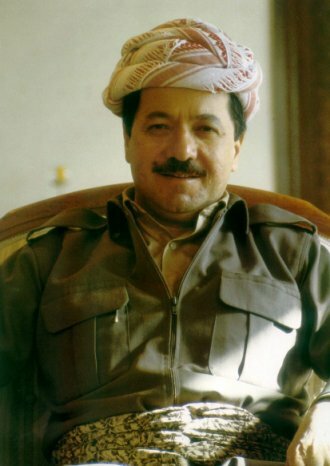 In the Amfal operations, he killed 203,000 Kurds. He used chemical weapons. In Halabja, he killed 5,375 people, all women, children and old men, in one attack—only one attack. Saddam killed more officers from the Iraqi army since the army was founded in 1921. Saddam did this with the hatred that I know was in his heart. With his revenge, only God knows what he was going to do. Because he had love of power, of making Muir rockets, paying millions to make some development for rockets to go further and warheads to become more destructive and to have weapon of mass description. At last Iraq had weapons of mass destruction. They were used against our nation in the north and south, and even against the Iranians when they penetrated the last defense lines in our terroritory. They were used by helicopters, by fighters and even by transport illusion 76, which it is not for bombing. But they were used in order to stop the invasion of Iran to the east of Basra, south of Iraq. This is Saddam. I want all the Americans please to know what Saddam was and then to make the assessment: Was it worth it? Was it good that America took the decision to go and liberate that country by removing Saddam’s regime or not? This is a very good question also. From what I know about Iraq and about Saddam, I am now one of the people who believes very, very, very clearly that the decision taken by this blessed nation, America, to go and liberate Iraq from the evil regime of that dictator, it was the right decision and the proper time. I don’t want to interfere in your politics. You are a free nation. You are the nation of democracy. It’s up to you, you have got many parties. I respect everybody in this country. I love America but this is the truth as an Iraqi I want to tell you that this was a great decision. I am very sorry for those who lost their beloved ones. I know it is difficult for them. But you should remember always you have done a great job. You have done a dramatic change in that country and you have liberated 27 million people from a dictatorship regime. (ZNDA: Baghdad) On Saturday April 1, a day most Assyrians celebrate as the first day of the Assyrian New Year, three car bombs exploded in the Assyrian market in Dora, a predominantly Christian and Sunni Arab area of Baghdad and one of the most dangerous parts of the Capital. Police said there were no police or army checkpoints in the area and it appeared that civilians were the targets. (ZNDA: Mosul) On 5 April Mr. Toma Hurmiz Toma al-Kanni was shot and killed by unidentified assailant(s). The shooting took place as Mr. al-Kanni was standing in his home front yard garden in the al-Mansour quarters of Mosul. From one repressive regime to another, the current situation of ethnoreligious minorities in Syria depicts a faint picture of the appalling and austere treatment of the Syrian detainees. Mr. Yacoub Hanna Shamoun, an Assyrian Christian from Syria has been detained without due process for over twenty years in Syria's horrendous AlSaydnaia prison. He has repeatedly been denied access to a legal representative and has been kept in isolation from his family, the legal system and human rights institutions. The tragic story of Mr. Shamoun began in 1985 upon his return to his ancestral homeland from seeking employment in Lebabnon since 1972 with his family. Their return was sparked by a fallacious amnesty issued by Syria's late President Hafez Al-Assad to all citizens who had failed to serve the required military term in late 1985, as was Mr. Yacoub's case. Mr. Yacoub and his brother Fawaz returned to Syria and surrendered themselves to the Conscription Department in Qamishly (a town located in the Syrian Jazeera, south of Nisibis, southeast Turkey) to serve the required military term as their national duty. To their surprise, the State Security Forces of the treacherous Baath government detained the two men on the night of July 1st 1985 and remanded them to the custody of the local prison where they had been tortured and beaten for a month. The daunting story of the two long lost brothers did not end there. The two brothers were taken to a remote prison where they would remain for many years without any contact with the outside world or their terrified family in Qamishly. The family had presumed the two brothers dead, until 1996 when Fawaz, the younger brother born in 1966 in the Assyrian town of Qamishly, was released from prison and returned home. The anxious family was in disbelief, presuming their sons had been lost forever. However, a dark cloud loomed over the family regarding the unknown whereabouts of their eldest son, Yacoub born in Qamishly in 1963. It was not until 2001 when the Security Department informed the family of Yacoub's whereabouts, in the town of Saydnaya where he continues to be illicitly detained for over twenty years without due process or a release date in the near future. Anyone who has been the victim of unlawful arrest or detention shall have an enforceable right to compensation . Each State Party shall make these offences punishable by appropriate penalties which take into account their grave nature . Accordingly, the treatment of the Shamoun brothers illustrates the grotesque reality of the dictatorial nature of the Baath regime and its treatment of ethnoreligious minorities such as Mr. Yacoub Shamoun and Mr. Fawaz Shamoun. The treatment Mr. Yacoub negates the rhetoric regarding the Syrian government's transparency, fairness, legitimacy and respect for both national and international legal instruments. The flagrant violations of Mr. Yacoub's indispensable human rights and dignity as outlined in a selection of international legal instruments that the Syrian government has ratified, only serves to confirm the repressive and inept nature of the government in implementing efficient, just and respectable standards of human rights for its citizens. As such, the Council for Assyrian Research and Development (herein CARD) urges the Syrian authorities to take immediate action in the release of Mr. Yacoub Hanna Shamoun and to ensure his safety and security in the Syrian Arab Republic as an ethnoreligious and indigenous minority. This must be necessitated in accordance with various international legal instruments that serve to uphold the rule of law for the appropriate and impartial treatment of detainees. CARD also urges the government to take proactive measures in ensuring the implementation and application of appropriate and necessary legal mechanisms that would emulate a reasonable and efficient due process and judicial system to protect its citizens from the oppressive nature of the state. Being under increasing international scrutiny for its poor human rights trackrecord, the Syrian government can show its commitment to fairness and human rights by releasing Mr. Shamoun and giving him the right to a fair trial. 1. International Covenant on Civil and Political Rights, 1966. (click here) . 2. Convention against Torture and Other Cruel, Inhuman or Degrading Treatment or Punishment, 1984. (click here) . (ZNDA: Brussels) The final debates of the European Parliament's plenary session were devoted on April 6th to three issues of human rights around the world. The European Parliament adopted resolutions on the situation in Darfur, on the Assyrian community in Iraq and the situation in prisons there, and on the case of gaoled Egyptian opposition politician Ayman Nour. Parliament's resolution on Iraq was adopted with 86 votes in favour, 1 against and 1 abstention. It covered two issues: the situation of the Assyrian community and Iraqi prisons. Regarding the Assyrian community (Chaldeans, Syriacs and other Christian minorities) MEPs strongly condemn all acts of violence against them. They urge the Iraqi authorities and the Multi-National Force (MNF-I) to find the perpetrators of these serious crimes and bring them to justice as soon as possible. MEPs urge Iraq’s authorities to protect the Assyrians from discrimination, in accordance with their international obligations. Parliament urges Iraq’s authorities to improve the security situation of the Assyrians and to facilitate the return and resettlement of Assyrian refugees in a secure environment where their customs and way of life are respected. It calls for the involvement of the Christians in Iraq in the reconstruction and administration of their land and villages in Northern Iraq and elsewhere in the region in order to preserve their cultural, religious and ethnic identity within one undivided country. MEPs strongly support calls by most Iraqi political and religious leaders for restraint and urges the communities in Iraq to come together in a spirit of dialogue and mutual respect; expresses its full support for the efforts of the UN in promoting intercommunal dialogue within the framework of a national dialogue; welcomes the initiative by the League of Arab States to hold a second conference on national reconciliation with the participation of all Iraqi communities. They urge the Constitutional Committee of the Iraqi Council of Representatives to preserve the cultural and religious rights of all Iraqi communities in its proposals for a constitutional amendment. MEPs call on the Commission and the Council to take all necessary measures to assist and protect the Assyrians. Regarding prisons is Iraq Parliament expresses its concern at the conditions of detention in prisons and other places of detention in Iraq. It reaffirms its condemnation of the use of torture and other cruel, inhuman or degrading treatment of prisoners and calls on the Iraqi authorities and the MNF-I to ensure that conditions of detention conform to international standards for the treatment of prisoners. It further calls on them to release immediately the identities of all remaining detainees and to ensure that they have access to legal counsel and prompt access to their families, and are informed of the reasons for their detention, as well as to put in place adequate safeguards to protect detainees from torture and ill-treatment: by ensuring that all allegations of such abuse are subject to prompt, thorough and independent investigation and that any military, security or other officials found to have used, ordered or authorised torture are brought to justice; by ensuring that detainees are able effectively to challenge their detention before a court and are subject to due process; by prosecuting all those currently held without charge for internationally recognisable criminal offences or else releasing them. MEPs welcome the ongoing investigations carried out by the MNF-I into allegations of abuse of prisoners and the inspection of places of detention throughout the country carried out by the Iraqi authorities. They also welcome the fact that more inspections are underway and that UNAMI encourages this process. Parliament calls on the MNF-I and the Iraqi authorities to grant the International Committee of the Red Cross unfettered access to all British and US detention facilities. Parliament supports the continuing efforts of the Iraqi Ministry of Human Rights to uphold high standards, including for people under detention and the EU’s Integrated Rule of Law Mission for Iraq (EUJUST LEX). It notes that the Iraqi authorities have requested that the mission be extended beyond the end of its current mandate and the scope of the training provided expanded. MEPs urge the Commission and the Council to extend the mission beyond the end of its current mandate and to expand the scope of the training provided to include forensic policing. Parliament calls on the Iraqi Council of Representatives to ratify the Convention against Torture and Other Cruel, Inhuman or Degrading Treatment or Punishment and calls on the Commission, the Council and the Member States to make further contributions to the strengthening of human rights and the rule of law in Iraq. The Assyrian Democratic Movement (Zowaa), Shuraya Party and the Chaldean Democratic Union Party failed to attend the conference. 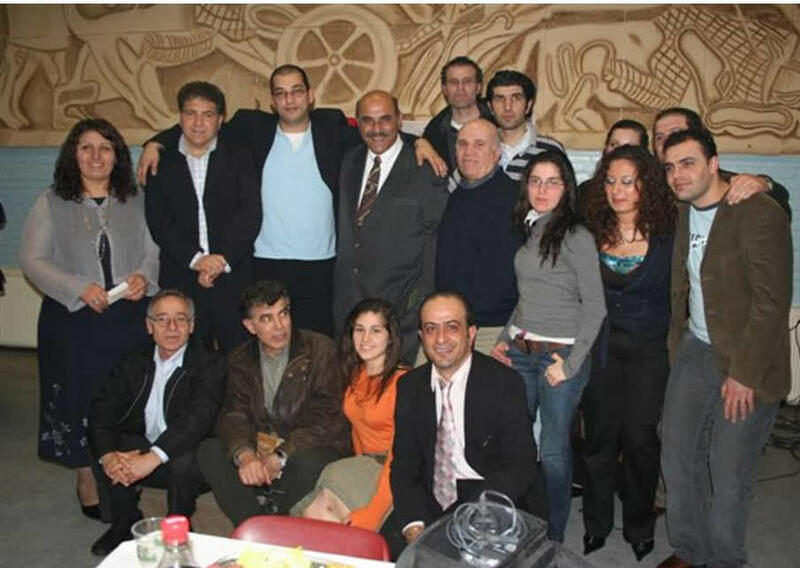 12 Assyrian political parties gather at the 2006 AUA Conference held in Hengelo, the Netherlands. Three major issues were presented on the agenda of this year's discussions: 1) the new constitution of Iraq, 2) the establishment of an administrative region in Iraq, and 3) to discuss the creation of a national Leadership. The atmosphere was somewhat tense on the first day as all the participants presented their case. It was soon decided that all parties prepare their objections to the Constitution of Iraq in writing for the next day and the session ended after only three hours. On the morning of the second day the atmosphere of the meeting had changed and a cool and relaxed attitude prevailed. This was very much thanks to the many hours of informal discussions in the hotel lobby, where new alliances had been made the night before and many different people sat down for a lively chatting, as is customary in most Assyrian political events. The prominent Assyrians in the Netherlands had a more positive outlook on the outcome of this conference. Many held the view that the participation of the 12 political parties in itself was half of the political victory and that the other 50% would follow if the participants could manage to agree on the smallest of the issues presented. “Other nations discuss their internal issues almost every day of the year in their parliaments, whereas we only meet each other every second year for only a couple of hours, at the best” said an older observer, a resident of Hengelo. Dr. Emanuel Kamber (right), Secretary General of the AUA, watches as a representative of an attending political party comments on the issue of establishing an Assyrian administrative unit in Iraq. The representitive of the Assyrian Democratic Movement in Scandinavia was however not equally eager about the conference. According to Mr Yousef Isho, the Assyrian Democratic Movement based its decision not to participate for three main reasons, starting with ADM's view that it would be wrong for parties gatherered abroad to make decisions regarding our rights in the homeland and that the views on Iraq's constitution and our rights, that are held by most parties in the diaspora, are unrealistic. Mr. Isho explained ADM's third reason in this way: "We realized that this conference would not change anything. Take for example the Amsterdam Conference three years ago. It did not change anything, then why should we believe that this one would create changes? We knew the results beforehand, and that’s why we didn’t participate”. Mr Yousef Isho stressed that the ADM respects all parties and their decision to participate. Shurya Party presented similiar reasons in a public statement prior to the conference explaining why it would not participate. But many analysts in Hengelo concluded that it was a serious mistake not to attend, especially on the part of ADM. “Either Zowaa believes it is too big and important for this conference or it is unwilling to show up among critics” said several participants to each other during the sessions. As for the Chaldean Democratic Union Party, the reason for their abscense seems to be a small logistic error as the invitation letter never reached them. And Mr. Behnam Jaboy Hanna, the parties representative in Europe underlines in a commentary to Zinda Magazine that his party would have attended if it had received the invitation. There have been many speculations on the outcome of this gathering. But what many people have failed to realize is that it should not be seen as a long-established AUA Conference. Its main aim was only to evaluate and exchange ideas on the most important issues facing our nation today and not to focus on consensus seeking or to reach specific agreements, as has been the case with former conferences. What became obvious for all the participants was the need for further discussions as there are many details to work out. Dr. Emanuel Kamber, the Secretary General of the AUA and chairman of the Conference explained that the AUA is keen on creating a more dynamic forum for the Assyrian parties by having conferences more frequently than before. That is also the reason why the next AUA conference is expected to be held already in the coming months. A formal declaration, signed by the participating parties is expected to be released soon. For more information search our previous articles using Zinda archives: click here. WASHINGTON, DC – Today, the U.S. Agency for International Development (USAID) and the U.S. Department of State announced that officials of Middle Eastern descent are gathering for a Leadership Assembly to discuss key objectives for the broader Middle East and North Africa region. The third in a series of events, the Leadership Assembly is hosted by USAID’s Office of Public Diplomacy for Middle Eastern Partnership Initiative (MEPI) Affairs, and includes a mix of national, state and local representatives, as well as officials from the White House, State Department and USAID. No where does the PBS special mention the Assyrian and Greek victims of the Seyfo Genocide. Zinda Magazine urges its readers to read the PBS Ombudsman's article above and send a feedback (click here) demanding an explanation and immediate response. 2 out of every 3 Assyrians perished during the Seyfo Genocide..
Jim Kunder, USAID’s Assistant Administrator for the Bureau of Asia and the Near East, will brief participants on USAID’s activities in the broader Middle East and North Africa. In the afternoon, the Leadership Assembly will discuss more in-depth policy issues at the State Department. Prominent Middle Eastern-Americans are in attendance, including Sen. John Sununu (R-NH); Rep. Nick Rahall (D-WV); U.S. Department of Health and Human Services Deputy Secretary Alex Azar; and Spencer Abraham, former Secretary of the U.S. Department of Energy. Now in its second year of operation, USAID’s MEPI office, in addition to organizing policy discussions, travels throughout the country explaining U.S. public diplomacy initiatives in the Middle East. 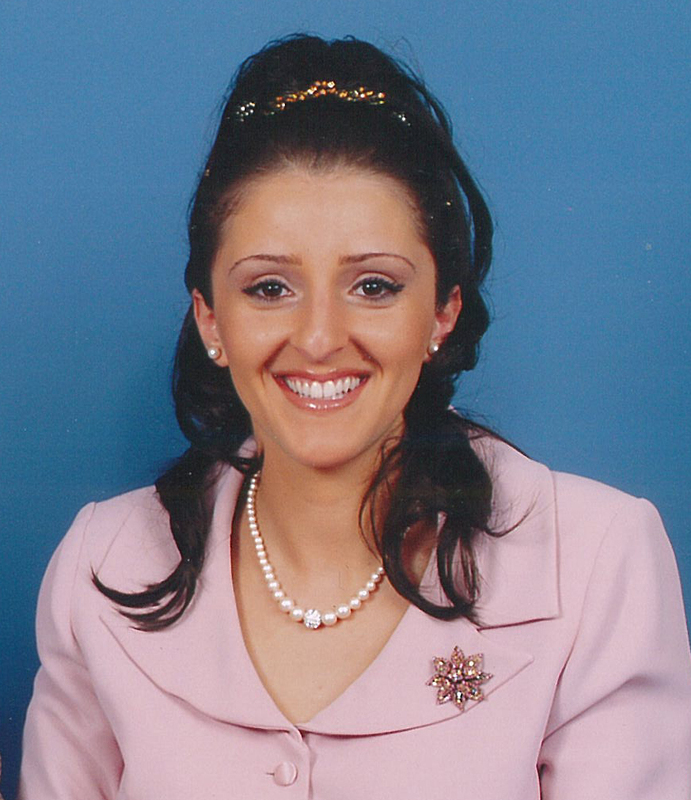 In March 2006, the office conducted presentations at several special events in Southern California – addressing the Council on American Islamic Relations, the Assyrian American Association of Southern California, the International Conference for the Lebanese Student of the World, as well as holding discussions with members of the Egyptian American community. Launched in October 2004, USAID’s MEPI program falls under the Bush Administration’s Middle East Partnership Initiative, calling for change in the Middle East. Funded with bipartisan support from the U.S. Congress, MEPI has brought the resources, experience, and determination of the United States to bear in an effort to bolster the reform movement in the Middle East. To learn more about USAID’s Middle Eastern public diplomacy efforts, click here. (ZNDA: Stockholm) On 22 November 2004, His Excellency Mohammad Bassam Hatem Imadi was sworn in as the Syrian ambassador to Sweden before President Bashar al-Assad of Syria in Damascus. The following is an open letter by Ms. Margareta Viklund, Chairwoman of the Swedish Committee for Assyrians to His Excellency. The letter was published in Swedish newspapers and the Swedish parliamentary member, Anneli Enochsson, is raising this issue in the Swedish parliament. As of today no one knows how many persons have been sent to the Syrian prisons without trials and sentences. The families of the prisoners are not informed on how their imprisoned relatives are treated, if they have been tortured or, sometimes, if they are even alive at all. The board of The Swedish Committee for Assyrians, SKA, has received information that an Assyrian man, Yacoub Hanna Shamoun, has been detained for the last twenty years in the prison of Al-Saydnaia without a fair trial or sentence and repeatedly tortured. The tragedy of Yacoub Hanna Shamoun began in 1985 when he returned to Syria with his family. He had been working in Lebanon since 1972. Despite promises of amnesty Yacoub Hanna and his brother were both imprisoned on their return to Syria. His brother has been released, but not Yacoub. 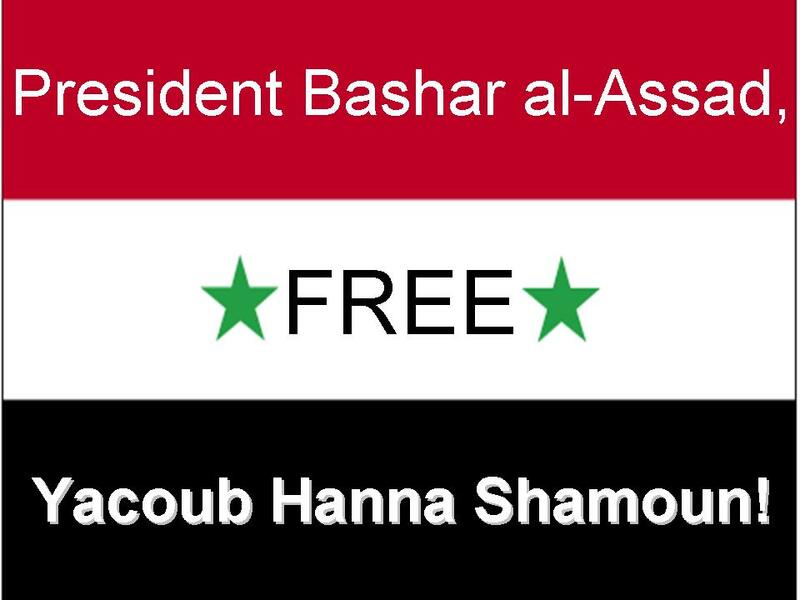 The treatment of Yacoub Hanna Shamoun is completely at odds with the promises of the Syrian state to implement human rights and juridical principals of justice in the country. Claims of open, honest and just trials, an independent judicial system and functioning human rights in Syria are thus consequently not true. With reference to all human rights and a fair trial, the board of the Swedish Committee for Assyrians, SKA, demands that the Assyrian Yacoub Hanna Shamoun be released immediately from prison and given a free and just trial. (ZNDA: Stockholm) Some days ago the two parties of the Assyria Liberation Party and the Assyrian Democratic Party announced their plans to unite after a conference held in Germany between the two sides. For individuals familiar with the Assyrian politics this hardly comes as a surprise as the two parties have had a history of successful cooperation since 1999. They have represented each other in different political arenas and have managed to harmonize their political views for a long period without any disturbance or interruptions. Both parties agree that this union shoudl be completed soon as the situation in Syria is rapidly becoming similar to that of Iraq. With a new and bigger party both sides hope to be prepared for the coming changes in Syria in order to claim what rightfully belongs to Assyria. This move marks a new era in the Assyrian politics, because never before have two Assyrian parties unified into one party. On the contrary, splits and bitter internal struggles have been common. Dr. Ibrahim Afram from Assyria Liberation Party tells of the effects of this news: "We have already seen how this has shocked Syria. And it seems as if people ask themselves whether this is really possible." He continous by explaining the next step for the unified parties: "Our aim is to create a solid Assyrian block in Syria ahead of the changes we know will come. This can only be done if Mtakasta (Assyrian Democratic Organization) decides to re-evaluate its current stand and join in." According to Dr. Ibrahim Afram the Assyrians of Syria can gain immensely if they solidify their aims and cooperate. The Assyrian rights as a minority in Syria will not just remain a dream, according to Dr. Afram. Time will tell if this bold move will have the impact on the ground to create changes both in the Assyrian and the syrian political arenas. To relieve our burdened feelings when it comes to patriotic goals and patriotic consciousness, and in line with our political conviction, we have reached the conclussion that a narrow mind is prevailent which says that we cannot cooperate. And this narrow point of view is prevailent in an extremely sensitive and turbulent period which the Assyrian question is experiencing along with the rest of the Middle East. In order to create a political will and confirmation and so that hope re-emerges among our people, we now emphasize that there is room for unity between our organizations, so that the patriotic work may regain its normality by indulging fully in the Assyrian question, for whose sake every party and organization was created in the first place, and so that we can claim our rights in our land, Assyria. As a confirmation to the above and as a result of our cooperation and a continuation on the formerly accepted declaration between the Assyrian Democratic Party and the Assyria Liberation Party that was signed on December 2000, and which was later enhanced and strengthened on Mars 2003; and in accordance with the general assemblies of both parties and the many meetings in Assyria and abroad, which all resulted in enhanced cooperation, our two parties gathered between April 3 and 4 of 2006 in a conference in Frankfurt, Germany, and discussded different issues of merger in a spirit of brotherhood and patriotism. After extensive discussions our Parties reached an agreement to form a joint Preparatory Committee consisting of members from both parties. One of the tasks of this committee is to prepare a new political program and a new structure for the new combined Party and to prepare a Congress for the new Party as soon as possible. The Preparatory Committee decides on its own on the date for the coming Congress. Long live the Assyrian martyrs. Iraq has occupied a central stage in the spread of Islam ever since Khalid and his forces ruptured the Sassanid empire, at the battle of Qadissiya in 636 C.E. The Arab horsemen came into contact with sizeable Christian communities at Hira in south-west Iraq that counted numerous monasteries and churches. In the eighth century, when the Abbasid Caliphs established their court in the newly built Baghdad, learning and culture reached a new apogee to which Christians made a seminal intellectual contribution. Philosophical and scientific thought excelled, articulate and informed exchanges took place between Christian and Muslim scholars. Christian translators, exemplified by Hunayn ibn Ishaq, made important contributions in the transmission of Greek philosophical thinking, via Syriac, into Arabic. Their efforts created the foundation of a tradition that has become embedded in the Shi'a 'ulama still found today at Najaf and Kerbala. the inherent capacity for dialogue and discussion, which has been well-honed over the centuries in encounters between Christianity and Islam must come to the forefront. 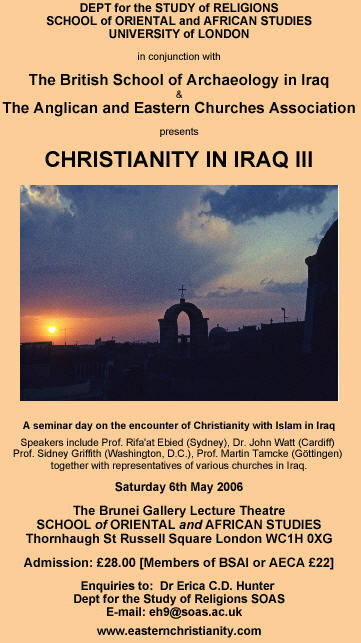 The morning session will consist of a series of papers exploring the encounter of Christianity with Islam, particularly the philosophical dialogues, in Abbassid Iraq. Prof. Rifa'at Ebied (Sydney): Peter of Callinicus and Damien of Alexandria: the Tritheist controversy of the 6th century. Dr. John Watt (Cardiff): Philosophy as a meeting point for Christians and Muslims in Early Abbassid Iraq. Patriarch Timothy I and an Aristotelian philosopher at the Caliph's Court. Prof. Martin Tamcke (Göttingen): World War I and the Assyrians. Modern encounters with Islam: The afternoon session investigates the challenges encountered by Christianity in Iraq today. The current situation will be discussed by representatives of the various Syriac Churches [the Assyrians, Chaldaeans, Syrian Orthodox and Syrian Catholic] who will be joined by the Chaldaean bishop of Baghdad (Saidna Androus). encounters between Christianity and Islam in Iraq today. *Please send proof of student status. Includes lunch, morning, afternoon tea/coffee. 'If the Iraqi woman has the support of other women, then we will change the country, believe me.' - Pascale Warda. Photo by Andy Nelson. (ZNDA: New York) On 7 April the Global Peace Initiative's "women's summit" brought together a cross section of Iraqi women to meet with American women in New York. Organizers say it wasn't easy - first, because of visa issues. But difficulties also stemmed from the desire to include a broad spectrum of Iraqi women - with a result that reveals the divisions in a torn country. Among the attendees from Iraq was Ms. Pascale Warda, former Minister of Migration and Displacement and the President of the Assyrian Women's Union. 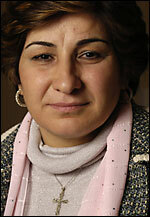 Ms. Pascale is also a prominent member of the Assyrian Democratic Movement or Zowaa. (ZNDA: Sydney) Police investigating a shooting murder have uncovered a Sydney (Australia) gang involved in elaborate extortion bids instilling fear of "extreme violence" in victims. Members of the "dlasthr" gang wear a distinctive clenched fist tattoo across their backs with the letters AK or dlasthr like a "badge of honour", according to police. Details of the gang, described as an Assyrian crime syndicate which operates from southwest Sydney, emerged in Liverpool Court last week. The alleged leader was identified in court papers as Ramon Youmaran. He is wanted for the 2002 murder of Dimitri Debaz who was shot dead outside a Sefton hotel. The gang's alleged activities have been highlighted by investigations into the shooting murder of Ramon Khananyah outside the Babylon Cafe in Fairfield last year. Police allege Samer Marcus, 30, from West Hoxton, could hold the key to solving the October 31 murder of Mr Khananyah. Marcus appeared in Liverpool Court last Tuesday charged over an unrelated extortion in which a man was allegedly threatened for his $45,000 car. Strike force Gain police, who have accused Marcus of being an active member of dlasthr, arrested him and charged him with robbery and demand money in company with menace. They allege he may have information about the Babylon Cafe murder. It was the fourth serious extortion matter to emerge last week. Two teenagers were charged by South East Asian organised crime squad officers after allegedly targeting a Kingsford teenager. A gang of three men allegedly kidnapped a man in Mt Pritchard last Monday and demanded a $20,000 ransom. A trial also began into the murder of university student Vay Linh Phun who was allegedly kidnapped and a $70,000 ransom demanded for her life. Police allege Marcus contacted a man through a friend and threatened the welfare of his family in return for a luxury car on January 4 this year. Magistrate Tony Marsden said police had "conversations which have been recorded by lawful intercept" and other evidence which provided a strong prosecution case. The court was told Marcus had a tattoo of a clenched fist across his back, which police allege indicates his membership of dlasthr. Marcus' solicitor Glenn Walters denied his client was a member of the gang and said the tattoo police claimed Marcus had offered no proof of membership. Police have received correspondence from Marcus stating he has no knowledge about the Babylon Cafe murder. Marcus was refused bail and remanded in custody. (ZNDA: The Netherlands) It was indeed a Lalyo Malyo with the Assyrian society full of people who were looking forward to see "Malphono" Ninos Aho and Seyfo specialist Sabri Atman together with Nineb Lamassu. The night was lively and motivating. The inspiriting poems of Ninos Aho, the passionate Seyfo lecture by Sabri Atman and the critical questions, and poetry of Nineb Lamassu paved the way for a truly remarkable night with Seyfo at its centre. The evening was organised by the Assyrian Youth Federation of Holland. To celebrate the new Assyrian year of 6756, and the initiation of a Seyfo institute. The evening started with classical music by the Mor Aphrem Choir directed by Mr. Elyas Mousaki. 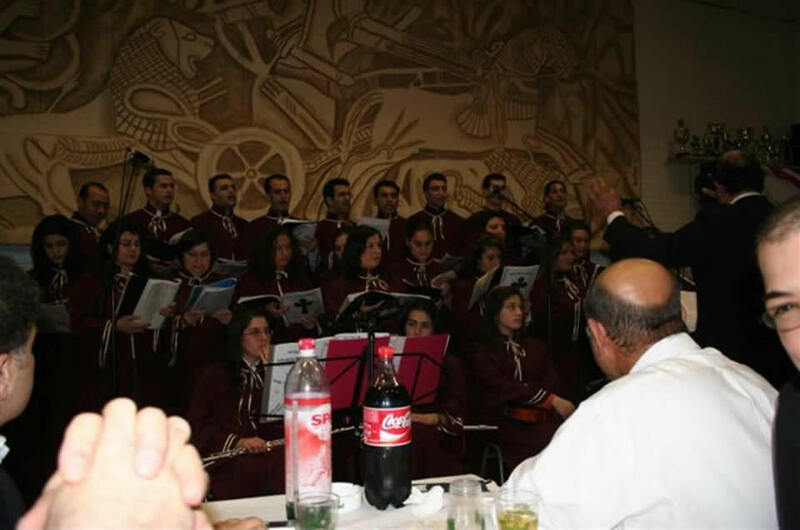 This musical presentation demonstrated the great accomplishment of Mr. Elyas Mousaki who started his first choir many years ago in Qameshli (Syria), and now in the Diaspora he together with the youth still revives the feeling of longing in our hearts through church songs and classic songs, the likes of: “Shamumar”, “Hano Kritho” and “Ninos Halyo”. The Choir started a few years ago in Holland. and now it has already produced a CD and performed in several different churches and meetings of Assyrian and other peoples. Then it was time for our special guest, Nineb Lamassu. He lives in London and is a friend of the Assyrian youth in Holland. His way of leading a discussion, and recital or poetry makes him an excellent debate moderator. 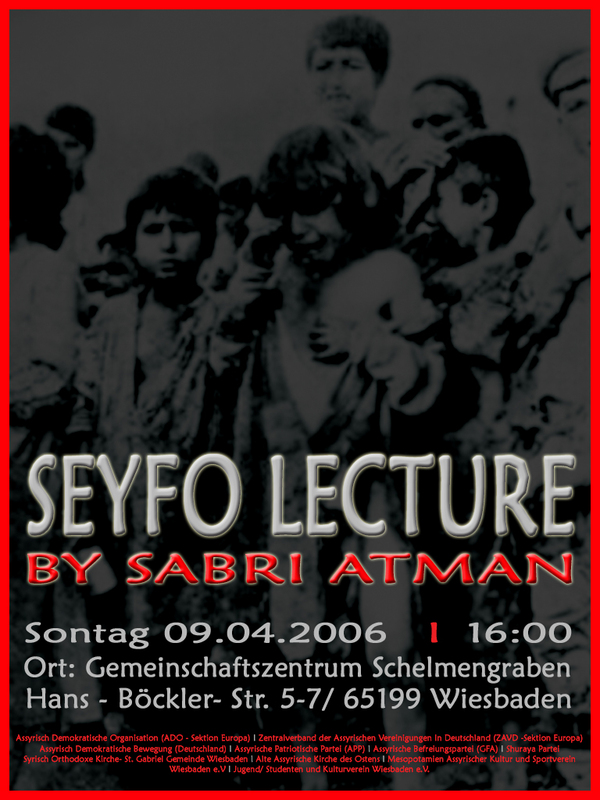 He questioned Mr. Atman about Seyfo, and the need to finance Seyfo campaigns. And Malphono Ninos Aho contributed with his legendary poems. First of all Nineb Lamassu asked about Mr. Atman’s activities, and Sabri opined that he together with other Assyrian youth created the “Stichting Assyrische studie en onderzoekscentrum” or Foundation of Assyrians studies and research. He explained the importance of this foundation. The architects of Seyfo had a purpose to slaughter the Assyrian Nation. They have not succeeded because we are still alive; alive and stronger than we were 90 years ago. Today Turkey is busy with great campaigns to instigate an organised denielist attacks. Our goal is to speak about Seyfo, to wake up the Assyrian Nation and solve our problems. With patience, pugnacity, the support of passionate youngsters and the Assyrian associations we will succeed in bringing Seyfo to the fore, in all European capitals. We had a full night with music, poems and a lecture, it was a Lalyo Malyo indeed. Hopefully AYF will organise more of these night because we all enjoyed them. After 90 years of silence, the Assyrian youth have overcame their trauma and are now finding the freedom to speak about Seyfo. Mr Atman is an example and a raw model for all of us. He encourages us to speak out and no longer accept the suppression of the Assyrian Nation. Malfono Ninos Aho, posses a captivating voice and the recital of his poetry has a message of hope and defiance. His poetry and his recital manifest what it takes to be an Assyrian. Nineb Lamassu, and his ability to chair a debate, creates an environment where he encourages the attendees to table their questions; thus elevating a discussion from boredom to a lively debate with lasting effect. The most interesting factor of the night was the poetry recitals of Malfono Ninos Aho and Nineb Lamassu. They alternated between reciting Assyrian poetry in both dialects, further reiterating the oneness of our language and identity. Ninos Aho closed the night with his poem “Athuraya Khatha”, demonstrating that to be a new Assyrian doesn’t mean you have to be young of age but you have to be young at heart, and individuals like Sabri Atman, Nineb Lamassu and Ninos Aho prove that to us. With their work and efforts they instil the spirit of gallantry in us as youth. This they did with me, and for that they deserve a big thank you. (ZNDA: Turlock) The Assyrian American Civic Club of Turlock celebrated the Assyrian New Year Friday night with a dinner and dance. The evening festivities began with the procession of the New Year King and Queen, Lenny Younadam and Jennifer Kiryakous, both of Modesto. In a speech Younadam gave at the celebration he talked about staying strong, sharing love, being prosperous, and the meaning of freedom. April 1st is the beginning of year 6,756 of the Assyrian calendar. Assyrian New Year was the biggest festival in ancient Assyrian and Babylonian Empires. It started on March 21st which was the first day of the month (Nissan) and the beginning of the New Year for the Assyrian calendar. This festival was celebrated for 12 days. With the invention of the Gregorian calendar the Assyrian New Year was moved to April 1. According to Yosip Bet-Yosip of the Assyrian American Civic Club each day of the twelve day celebration symbolized a month of the year. “During those twelve days they had to tell a story of creation, God, and the universe,” said Bet-Yosip. Two important things happened during ancient Assyrian New Year celebrations. The first was the dethroning of the king. Every new year the king's crown was taken and he became a regular citizen. If he wasn't a good ruler he wouldn't be given back the kingdom. The second important event at the new year was the rewarding of the man of the year with gifts. The ancient Assyrians picked the spring equinox as their new year to celebrate the rebirth of life. (ZNDA: Hamilton) One of the great advantages of University life is that students are exposed to various different cultures and customs. McMaster University (Hamilton, Canada) is enriched with a diverse community of students from all around the world and the University celebrates this diversity annually with a multicultural day entitled Pangaea. The Assyrian flag is displayed among other national flags presented at the Pangaea. Pangaea is a term given for the world’s land mass before its division into different continents. The Assyrian Chaldean Syriac Student Union at McMaster University (ACSSU @ Mac) has been a part of this celebration for the past 3 years, yet the success of this year measured far beyond any other. 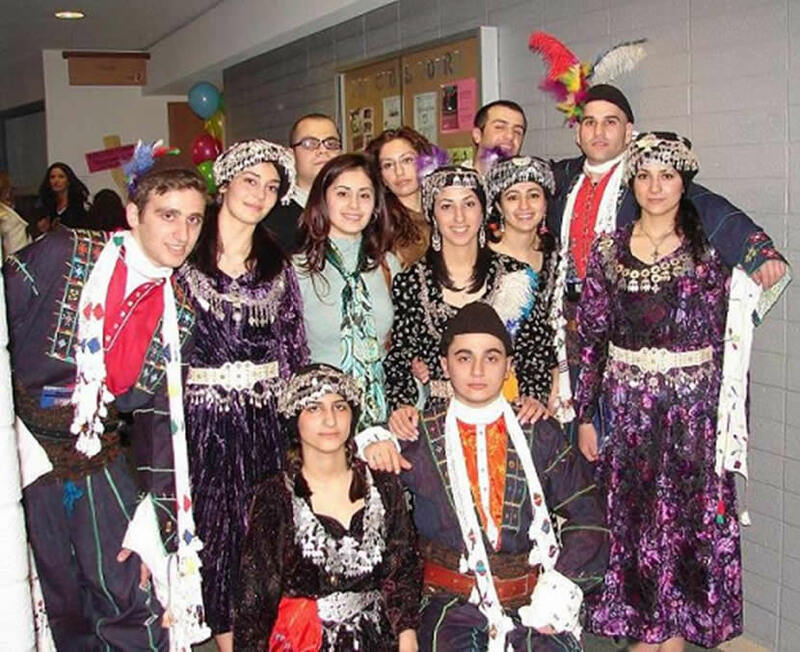 The ACSSU at Mac, the ACSSU at York University and ACSSU at the University of Toronto are branches of the Assyrian Chaldean Syriac Student Union of Canada. ACSSU @Mac performers along with ACSSU of Canada members. Sitting are Mariam and George; from L to R: Zaid, Renya, Alda, Sandy, Nahreen, Sargon, Atour; back: Ramen, Ashorina, Rimon. From the land between Tigris and Euphrates, we present to you the Assyrian Chaldean Syriac students. We bloomed for over 7000 years in the cradle of civilization. Our people have been able to survive unthinkable atrocities, but because of out strong unity and rich culture, we are standing here today and able to present to you some of our timeless music and dances. Assyrian food served by Karin (front) and Sandy (back). The dedication and devotion of the members was well-founded as they performed with great enthusiasm, pride and left the audience impressed beyond anyone's expectations. In order to display our cultural information and allow the guests to sample our traditional foods a pavilion was arranged. Organization of the pavilion was the responsibility of the pavilion committee. The members of this committee worked extremely hard in ensuring the pavilion was to the highest standards. Much gratitude must also be given to the ACSSU at Mac families for preparing such traditional foods and delicacies as dolma, biryane, boraq, kuba d’Mosul, halwa, kletche, zelabya and many more. ACSSU @ Mac feels it is crucial to take part in this celebration yearly to make others aware of our rich culture. Feedback is always positive from the over 300 guests that watch the show and enter the pavilion to taste the food, view the historical pictures and discuss historical and cultural issues. At the beginning of its political struggle the Assyrian Democratic Movement, ADM, made every effort to create an ideological and intellectual foundation in order to be prepared for the future tasks. In addition to ideology it had to establish a political structure enabling ChaldoAssyrians to take an active interest in politics, while own political work among our people at that time was almost non-existent. Another essential undertaking was to make clear the Assyrian identity and our rights, both internally among our people and externally to other nations and groups. During this period the pioneers in ADM carried out their tasks under great pressure and several of them sacrificed their life. An essential milestone in ADM’s history after the initial establishment is to be traced to the middle of 1980s when the party started an armed struggle in Northern Iraq. The transition occurred as a consequence of the cruel persecution which had been carried out by the Bath-regime in Baghdad against Assyrian nationalists and intellectuals. This period was characterized by tow major processes. The first is related to cooperation with different organisations within the Iraqi opposition, in many cases the cooperation turned out to be difficult, despite that ADM managed to overcome the obstacles and work with other organisations in an appropriate way to serve the cause of our people. The second process has to do with ADM’s most important goal, i.e. to mobilize our people in order to carry on the struggle. To be able to do that ADM had to face many problems depending on lack of national awareness and political traditions and dissonance. Another milestone is ADM’s participation in the Kurdish provincial government in Northern Iraq in the beginning of 1990s. During this period a new experience emerged; Zawaa was involved in establishing democracy and the building of different institutions of the civilian society. Furthermore Zawaa was representing ChaldoAssyrians and performed a hard work to put the ChaldoAssyrian issue on the political agenda. Several important achievements were made, e.g. education in Syriac and recognition of our ethnical and political rights by an increasingly number of people, respectively on national and international level. A third major turning-point, probably the most critical, in ADM’s history is being a part of the central Iraqi government after overthrowing the dictatorship on April 2003. Taking into consideration its long political work and good relations to other Iraqi organisations, Zawaa succeeded to receive recognition of our rights as an ethnical group. These achievements constitute a stable foundation for the party to be an important participant in the ongoing democracy process in Iraq. But this doesn’t mean that Zawaa entirely can rely on previous achievements and wait for a positive outcome. Having in mind the complexity of the political and social structure, especially for our people, the leadership of Zawaa should be able to make a distinct identification of the problems we are facing and take relevant measures to solve them. They have to deal with the name issue in more pragmatic and transparent way, as they should do with several other problems, like internal conflicts among ChaldoAssyrians and defamation, which divert focus from our fundamental issue, i.e. the legitimate rights of our people, the indigenous people of Mesopotamia. The political process in Iraq is proceeding while every group is trying to strengthen its own position. In the near future Zawaa has to succeed in building alliances with other parties and fractions among our people in order to achieve a unified front and a strong leadership representing the largest possible number of our people. Otherwise we will miss a historical opportunity to realize the hopes and expectations of many ChaldoAssyrians. This week with my family I attended the Assyrian New Year Parade organized by AANF affiliates and other groups in Central Valley California. It was definitely a joyful moment for me to celebrate this important national day with my community. However I was surprised to find out that some of our associations and clubs and all church groups had not participated in the event labeling it political or partisan. I was also expecting strong presence from Assyrian groups of greater Bay area and other cities in Northern California. The Assyrian New Year Parade is a national and cultural event. This event identifies us as a living people with a living culture. It is extremely important that we take this parade seriously and participate in it with our full capacity regardless of our political, denominational, and community differences. The Assyrian New Year Parade should be a must attend event for all of us. At least once a year we must put our differences aside and participate in this event with all our capacities. I see no reasons why celebration of the Assyrian New Year must be marked as a political event. I am hoping this coming year we make a dramatic change in our thinking with regard to this event. Here in Central Valley California our demographics allow us to make Assyrian New Year Parade even bigger than Saint Patrick Day Parade. We should celebrate Kha-B-Nissan not with a few hundreds in our own backyard but right in downtown Modesto with thousands of participants. Here I would like to propose that a steering committee be formed by our leading organizations to plan an Akitu Festival in northern California that is spectacular, unifying and inclusive with thousands of participants from all across Northern California. Such an event not only will help us at least once a year to put our differences aside and enjoy a day of celebration all together but also will make the presence of our community known to local politicians and local media and will increase their interest in our community. My name is Raz Zimmt and I am a graduate student at the School of History/Middle Eastern Studies Dept. in Tel Aviv University. My Ph.D thesis deals with the attitude of Mohammad Reza Pahlavi towards religious minorities in Iran (Jews, Christians, Zoroastrians and Bahai's) during the "White Revolution" period (1963-1979). Although many books and articles have been written concerning this period, almost none of them dealt with the Pahlavi attitude towards the religious minorities in general and towards the Assyrians in particular. I would appreciate any advice concerning possible sources (documents, newspapers, archives etc.) which might be relevant to Mohammad Reza Shah's attitude (Ideological approach and policy) towards the religious minorities in general and the Assyrians in particular. I can read Persian as well. I believe my research could bring a unique point of view with regard to the history of Iranian Assyrians and other religous minorities during the Pahlavi period. If you are interested in registering for this conference, please click here. For many centuries Ukraine was part of the Russian Empire and later of the Sovjet Union. Assyrians from the Iranian and Turkish parts of Assyria have been living in the Russian Empire since the 18th century. The reason for the Assyrians' emigration was often fear of persecution by Turkish and Iranian [then Persian] authorities. In the Russian-Turkish wars, Assyrians often supported the christian nation of Russia which they regarded as a saviour. During the 18th century Assyrian merchants travelled often from Turkey and Iran to the Russian empire, areas which included Ukraine, to conduct business. The road from the Middle East to Europe used by Assyrians went through northern Caucasus and Ukraine and a number of Assyrians settled in those regions. In the Ukrainian city of Vinnitsa, with a million inhabitants today, lying 250 kilometers southwest of the capital Kiev in the southwest of Ukraine, there were several Assyrian families by the 18th century. Most of the Assyrians in Vinnitsa came from Iran and Turkey and managed to escape to Russia during the massacres of the Christians committed by Turks and Kurds during the First World War [1914-1918]. In this War Assyrians fought for their freedom with the help of the Russians. But after the Russian revolution of 1917, Russia withdrew from the war against the Turks and left the Assyrians alone and abandoned before their arch enemies. Some Assyrians ended up in Vinnitsa from other parts of Ukraine and the Soviet Union during and after the Second World War [1939-1945]. Aproximatley ten years ago there were about one hundred Assyrian families in Vinnitsa. Some of them later moved to Russia or the U.S. Today there are about 40 Assyrian families left in Vinnitsa, most of them born in Ukraine. Most of them trace their origins to Iran (mainly from Urmia) and from Turkey (Gjavar, Diz, Shaput). After the collapse of the Soviet Union the Assyrian families arrived to Ukraine (and to Vinnitsa) from poorer countries in the Caucasus. Those were mostly descendants of the Urmian Assyrians. In the larger Ukrainian cities like Kiev, Lvov and Odessa there are some western and eastern Assyrian families from Syria and Iraq. These Assyrian families are the newly-arriving emigrants who have become stranded in Ukraine on their way to western Europe. Some of them are Assyrians who married Ukrainians during their univeristy studies in Ukraine. In Vinnitsa there is today a school where lessons in the Assyrian language are taught. Most of the students are young Assyrians. 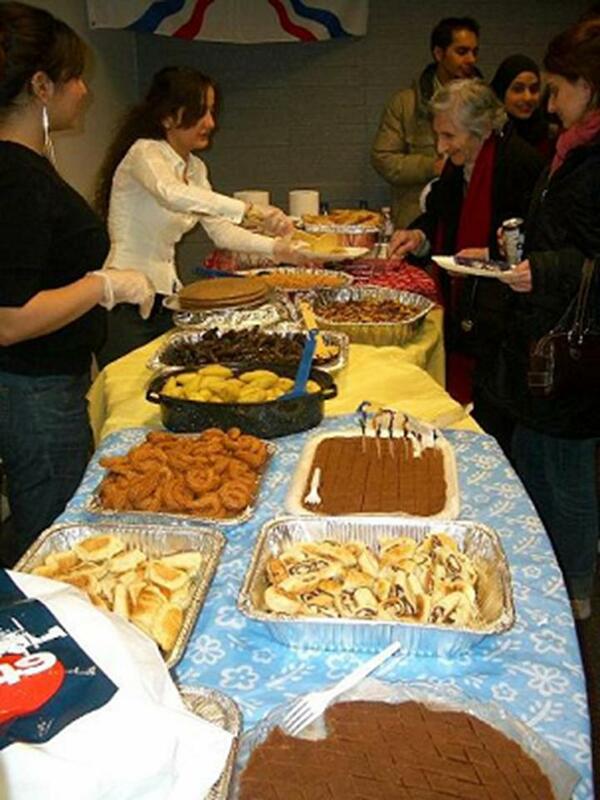 The school also functions as a meeting place for local Assyrians. I am the Assyrian teacher and chairman of the Assyrian club of Vinnitsa (the Assyrian National Congress in the Vinnitsa region). 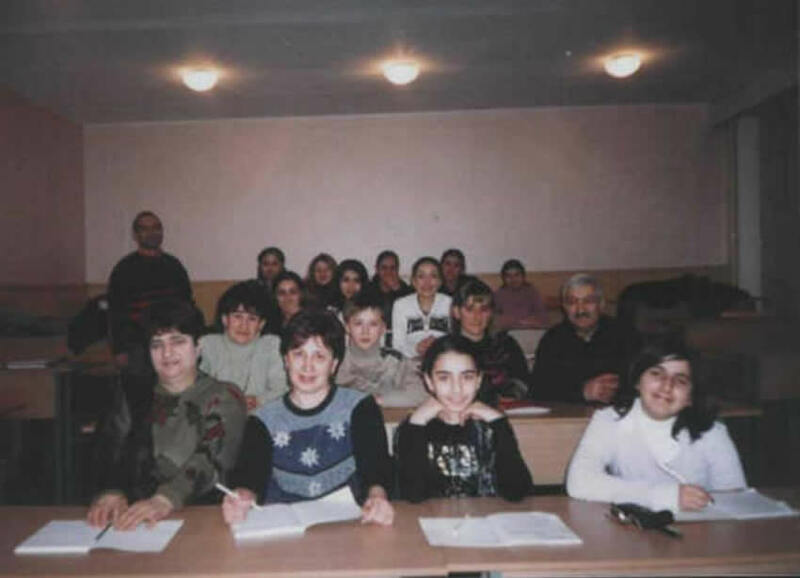 Students at the Assyrian language class in Vinnitsa, Ukraine. The author, Alexander Avchijev, stands in the back. The problem of integration is not present, but the problem of voluntary assimilation is a threatening factor for the preservation of the Assyrian culture. In order to preserve language, traditions and culture, more economic recourses are needed than what the Assyrian club collects today by membership fees. The Assyrian club of Vinnitsa does not recieve any economic aid from the Ukrainian state. Most of the successful Assyrians have left Ukraine. 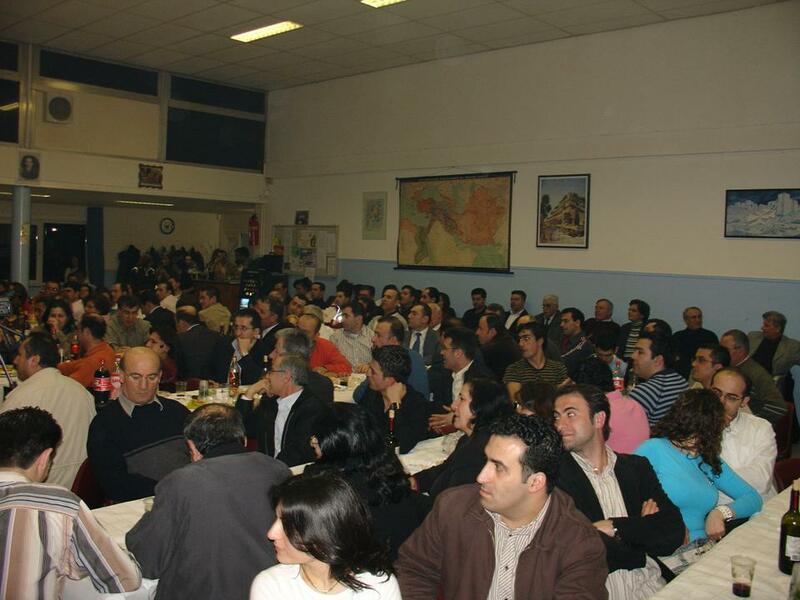 The Assyrian club of Vinnitsa hopes to establish strong relations with the Assyrian diaspora in the rest of the world. The city of Vinnitsa was founded around 1360 AD. Vinnitsa stands on the banks of the river Yuzhnyi Boog, and is located 260 kilometers south-west of Kiev, Ukraine's capital. It is famous for its many Orthodox, Catholic and Protestant churches and cathedrals, as well as many other places which are worth visiting. Its name can be traced to the word "wine" as the city was well known for its wine cellars - one reason which may have attracted the wine-growing Assyrians of the Urmia in Iran. 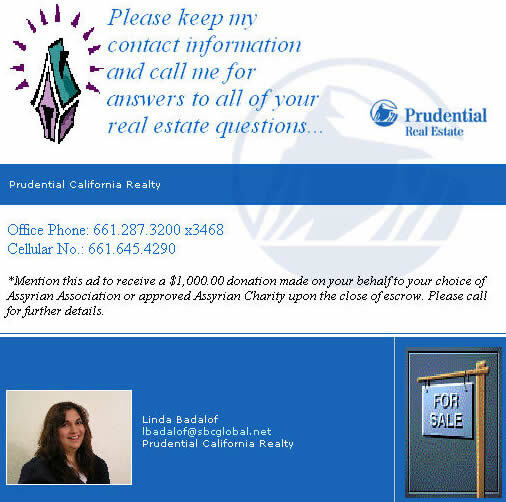 If you are interested in financially assisting the Assyrians of Ukraine, contact Zinda Magazine or the aforementioned Assyrian organization in Vinnitsa directly at the contact info provided above. Zinda Magazine invites Assyrians from Ukraine who now reside in the Western countries to form charitable groups to strengthen the Assyrian communities in Ukraine. Students and scholars are also encouraged to examine the rich history of the Assyrian migrations to Russia and today's independent republics between early 1800s and the present time. For more information contact Zinda Magazine at zcrew@zindamagazine.com . The Assyrian Universal Alliance (AUA) invited many political organizations to a conference in order to address important issues facing our nation. The general conference met for two days in Hengelo, Holland, on April 1-2, 2006. That we are one people (past, present, and future) and that should be the foundation for future communications. That the Iraqi Constitution with its current language is unfair to "our people" especially in the Preamble that ignored the role of our civilization and the tragedies that our people have faced. The role of Shari'aa, which would marginalize certain basic rights of the non-Muslims. A self-administrative area in regions where our people have existed historically and geographically. To establish a common national congress to represent "our people". The formation of such congress is to be studied thoroughly and be addressed in upcoming conference. Condemn terrorism that targets the Iraqi people and condemn the bombings of all places of worship. The conference condemned as well the ongoing efforts to paint certain areas as demographically being of certain sect or faith through forced deportation, and demographic change that "our people" are subjected to. Asked for a speedy establishment of a government that represents and includes all Iraqi groups. Rejected attempts by foreign parties to interfere in our people's internal decision making process and rejected any mandates over our people's institutions. Supported the ongoing efforts to bring democracy through peaceful manner in Syria. This process would ultimately lead to the recognition of our people's national rights as the indigenous people of Syria within the Syrian national framework and within a secular and pluralistic system. If we recall the final declaration of the October 22-23, 2003 ChaldoAssyrian Syriac National Conference held in Baghdad, organized by the ADM and the ChaldoAssyrian National Council, we realize that the demands of the Holland Conference were basically nothing but a repetition of what the ADM has been saying for the last three years. The puzzle here is that most of the groups that met in Holland have directly or indirectly attacked, ridiculed, and marginalized the ADM for using terms such as "Our People" or "ChaldoAssyrians" for the last three years. T hese groups and their supporters have either insisted that they were Assyrians or Chaldeans. Well, what happened in Holland? Why are we referred to as "Our People", not in one, not in two, but in ten different incidents in the final declaration? Where is, for example, the Assyrian name that these groups have been bragging about for three years? How are we to read the Holland Conference? Brother Fil from Canada writes: "Now that is good too because we now see that these groups are either acknowledging the writing on wall or making overtures to tell ADM that we are evolving by recognizing that hard facts." Brother Alfred from California writes: "This conference in fact reveals only one very important fact about confirming the correct policy of the ADM and the special class of its leadership and how far they are ahead of all these rookies who need a lot to learn about politics and the leadership of a nation, …"
Brother Gaby from Australia writes: "What a waste of an Airline ticket, do these people believe that we are so gullible we will again fall for this façade that we have been subjected to for the past thirty years? This is not unity, only another struggle for power that will cause more damage and division. Why don’t they say what is really on their minds? What are they afraid of? The declaration is an insult to anyone with half a brain. IT HAS ALREADY BEEN DONE PEOPLE, THINK OF SOMETHING NEW!!!!! PATHETIC." In my opinion, the AUA and the other groups that use the title "Assyrian" as a representative of our people sought to compromise regarding the name issue since there were couple of groups in the conference that still do not agree with the use of the name Assyrian as inclusive title for our people. The question is, if these groups needed to compromise because of the presence of the Chaldean and Syriac political groups in the conference, why is it so hard to understand the compromise of the ADM that represents hundreds of thousands in Iraq, many of whom are still undecided about the name issue? Furthermore, I need to stress that we must be pleased because every genuine unity effort must be blessed and supported. While everything related to the conference is not visible and known publicly, I personally will wait and see where the future conferences that were promised to take place are heading. Lately, an organized campaign by the Kurdistan Democratic Party (KDP) has been initiated with the purpose of selling Mr. Sargis Aghajan, Deputy Prime Minister and Minister of Finance and Economy for the Northern Iraq Kurdish Regional Government (KRG), to the Assyrian public. Of course, the KDP has created Ishtar TV and now this Satellite TV station and other media outlets linked to the KDP are being pushed to interview, and write articles about, Aghajan repeatedly to popularize him. Aghajan was a member of the Bet-Nahrain Democratic Party (BNDP) earlier in his political career as he personally indicated when he showed a photo of himself and other cadres of the BNDP in early 1980s during an interview, which is translated below. Mr. Aghajan's purpose from the said interview was to give his perspective of how the Assyrian groups were established and how they began communications with the KDP. He is in essence attempting to show that it was the KDP that made the presence of those Assyrian political groups possible. As Iraq is being transformed and the foundation for a Kurdish state is put in motion, the KDP is working hard to undermine legitimate Assyrian political groups. From one end, the KDP has begun to cooperate with the various Assyrian religious institutions and clergymen in an effort to undermine and marginalize the Assyrian national movement and political organizations. From the other end, the KDP is pushing people such as Sargis Aghajan, Abd al-Ahad Afram Sawa, Romeo Hakkari, and other members or supporters of the KDP, to be the representatives for the Assyrians. The KDP included Abd al-Ahad Afram Sawa and Romeo Hakkari on the Kurdish slate for the 2005 Iraqi elections and those two are now members of Iraqi parliament. While the reputation of these two has preceded them, the KDP is concentrating and making a bet on Sargis Aghajan for the future. The Kurds gave Aghajan the authority to appropriate and distribute to his discretion the $33 million assigned for the ChaldoAssyrian reconstruction projects thus presenting him as an Assyrian hero. Of course, the $33 million is not Kurdish money but Iraqi oil money assigned for the ChaldoAssyrians by the United States; however, and unfortunately and unfairly, the U.S. handed over the money to the Kurds and authorized the KRG to spend and distribute the money. The latest interview with Sargis Aghajan, Deputy Prime Minister and Minister of Finance and Economy for the Northern Iraq Regional Kurdish Government was conducted in Arabic by Wisam Kako on February 20, 2006 and posted on http://www.kaldaya.net/OurVillages/sarkis2.html on March 27, 2006. I am not going to translate the interview word by word; however, here are the important issues that Mr. Aghajan addressed. Sargis Aghajan states that the latest changes in the KRG would not affect his efforts to serve our people. He stated that the presence of Mr. Nejervan Barazani at the leadership of the KRG gives him a tremendous push to accomplish his work. He stressed that our people feel empowered these days and that they are not subject or submissive to others because things are different now. He says that many [Assyrians or Assyrian groups] have presented themselves bigger than they really are and they claim of imaginative victories that do not exist. Aghajan states that the first Assyrian organization in northern Iraq was Atour (Assyria) Democratic Party, which was an underground party in principle. Its cadre generally distributed patriotic literature to its supporters. Among the leaders of this party was Nimrod Yousif who is perhaps in Denmark or Canada at this time. Mr. Nimrod was the link between the head of the organization and the supporters and cadre. Later Nimrod joined the KDP and the activities of this party continued until 1982. At the end of 1981, the BNDP - Chicago sent a letter to the KDP leadership under the title header of "A National Home for the Assyrians". In the letter, Article 1, the BNDP requested from the KDP to be considered as a strong and real ally from the first degree to the KDP. In Article 3, the BNDP stressed that it had supported the KDP and the Kurdish movement in its radio broadcastings and literature. 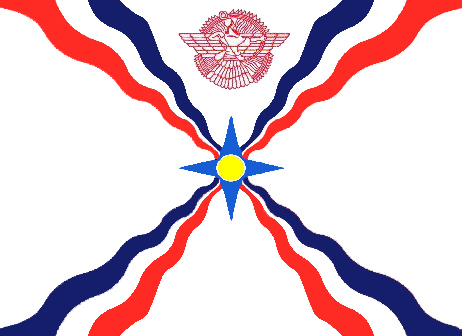 Article 4 states that the rights of the Assyrians, with all their sects Chaldeans, Suryanis, Jacobites, Mandeans, and Nestorians are linked organically with the Kurdish national rights and that the BNDP seeks to build strong relations with the KDP. Sargon David Isaaq, Central Committee member of the BNDP, signed the letter. In 1982, the BNDP sent David Yaqu Barno, a central committee member, to negotiate with the KDP. They met first in Damascus and later on May 23, 1982 in the village of Razan near Urmia. On May 28, 1982, a larger meeting for the Christians occurred in Zewah with David Yaqu Barno in the home of Rayyis (title) Ayyo Khoshaba (a KDP member responsible for all the KDP provisions). On June 6, 1982, the Secretary General of the KDP met David Yaqu Barno, the BNDP representative. After that meeting, the KDP responded to the letter of the BNDP with its letter number 3868 dated June 8, 1982. Article 5 of the letter declared that the KDP accepted the joining of BNDP in the Iraq Patriotic Democratic Front. Article 5 stated that the KDP would work hard to re-establish and bring to life the Force of Hurmiz Malik Chikko and support it militarily and materialistically. The KDP wished that this new collaboration would push the movement for democratic Iraq and true self-rule in Kurdistan. The KDP letter was stamped with the seal of the Political Bureau of the KDP. After a period of collaboration between David Yaqu Barno and the KDP, he left abroad and it was expected that he would return within 6 months. A branch for the BNDP was established in Zewah and a large sign was placed at the entrance of this new BNDP branch. Later, many members of Atour (Assyria) Democratic Party joined the BNDP. 1. Sent a group or detachment to Syria to bring weapons. 2. Open a branch in Bahdinan. 4. Upon his return, David would go to Nineveh and take military responsibility off BNDP there. 5. To bomb the Oil pipeline between Iraq and Turkey. 6. To start a radio station to broadcast in Syriac. Six months passed and David Yaqu Barno did not return. At this time, the BNDP was 350 members strong, some in Tehran, others in Urmia, Iran, and the rest in Zewah and Dohuk, in northern Iraq. After much insistence, David Yaqu Barno returned to Iran and met with his group and stated that we have weapons and money in Syria, why ask from others? He told us, adds Aghajan, that if we sent a detachment to Syria they could bring the weapons. It was decided to send 14 young men to Tehran. Dr. Ibrahim Barkho entered these men in a camp and got them a one-time entrance visa to Syria. They arrived in Syria and Dr. Barkho provided an office for them in Qamishli. The BNDP members in Iraq waited for David Yaqu Barno, but the weapons did not arrive. It became later known that the BNDP had met in Damascus and fired Dr. Ibrahim Barkho and the 14 members and a split occurred in the party ultimately. Soon after, many members of the BNDP left Iraq to Europe through Syria. On June 18, 1984, visas for 36 members were obtained. Later in July 7, 1984, more visas for 60 more were obtained. Aghajan describes in details an operation that was planned by the BNDP to bomb the Iraqi-Turkish oil pipeline in order to attract the world's attention to the Assyrian cause; however, the plan was abandoned. In June 1982, Aghajan States, five fugitives met with the Iraqi Communist Party (ICP) in Bahdinan (Dohuk). They told the ICP that they were members of the Assyrian Democratic Movement (ADM) and that they needed the ICP to arrange a meeting between them and the KDP. June 11, 1982, the ICP sent a letter number 20 to the KDP in that regard. After meeting with the five ADM members, the KDP replied to the ICP with its letter # 4013 dated June 18, 1982. In that letter, the KDP stated that they assured the ADM members that they support them and approved opening branches for the ADM where Assyrians resided and that their position in regards to the joining of the Iraq Patriotic Democratic Front is similar to that of the ICP. 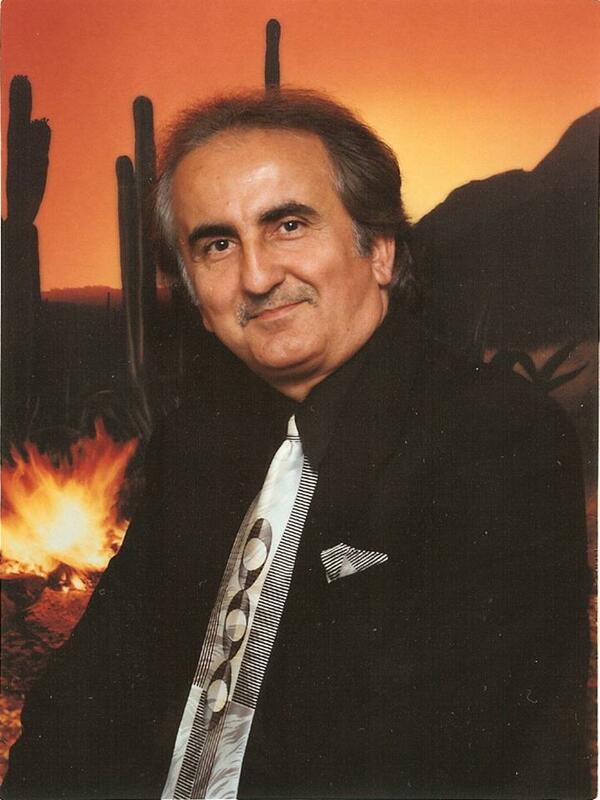 In 1983, states Aghajan, a man named Nisan Kani arrived to Kurdistan from the U.S. He was a cadre of the KDP. He asked permission to start a new organization. Aghajan states that he personally refused since the BNDP and ADM were already on the ground. With the insistence of Nisan Kani, the KDP approved the formation of a new party in its letter # 5194 dated July 30, 1983 under the title of the Assyrian Democratic Gathering. In the mid 1980s, a group from the ADM split and formed ADM–Patriotic Path. Later, the two groups of the Assyrian Democratic Gathering and ADM–Patriotic Path joined forces and formed the Assyrian Democratic Union. However, they do not have any members left on the ground, but few of them issue declarations every now and then. (ZNDA: Boston) The Middle East Studies Association of North America, the large and prestigious scholarly organization devoted to promoting Middle East studies, will hold its 40th anniversary annual meeting in Boston, Massachusetts between Nov. 18 - 21, 2006. For this year’s annual meeting, a record eleven presentations, focused on Assyrians in the modern period, have been accepted on the program. 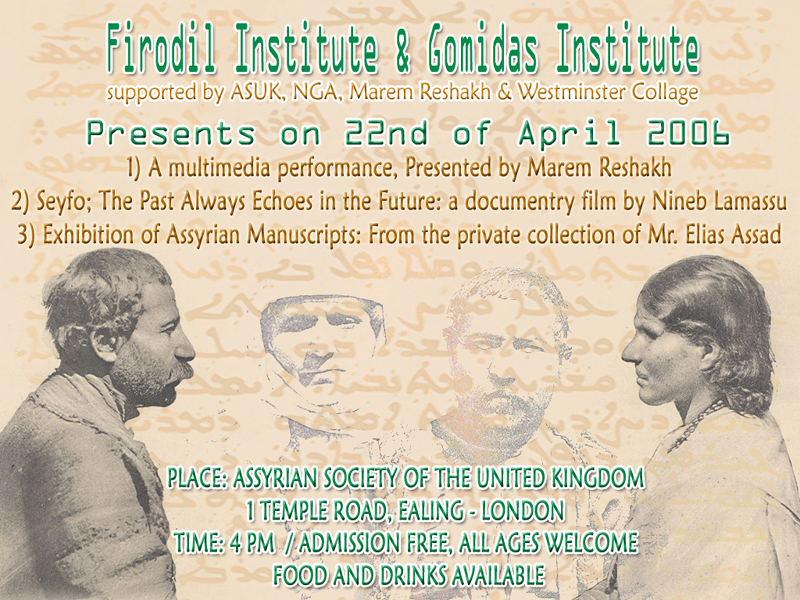 For nearly a decade, the Assyrian Academic Society, an affiliate of MESA, has encouraged presentations based on Assyrian topics in order to improve the body of research and information available to academia about the most neglected indigenous minority of the Middle East. Ms. Nadia Joseph, an AAS past president, promoted the affiliation with MESA in a far-sighted and constructive strategy. For years, there have been either whole panels or papers about Assyrians at every MESA meeting. Two years ago, for the San Francisco meeting (2004), all Assyrian presentation submissions met with rejection at MESA meetings. It was at the Anchorage meeting the year before (2003) that “Kurdistan” had suddenly become heavily represented at MESA, the year that only two Assyrian presentations appeared on the program (Sargon Donabed and Dr. Eden Naby). In response to the rejections, the Assyrian Academic Society mounted a vigorous protest charging the MESA selection committee with bias against Assyrian topics. Since the selection process is “blind” to the presenter, the only conclusion to be drawn was that the usual forces allied against Assyrians in the Middle East had simply dismissed topics related to Assyrians with the excuse that the presentation proposals did not meet competitive standards. As a result of such discouragement, in the subsequent MESA meeting in Washington, DC (2005), only two individual papers were submitted and presented (Nicholas Al-Jeloo and Dr. Naby). For these reasons, it is a very good sign of the success of Assyrian scholars, especially the young and energetic new graduate students, that for the second time at MESA (the first was in Washington, DC in 2002), there are two panels accepted plus an additional individual paper. Sargon Donabed (PhD candidate at the University of Toronto) organized the two panels. The individual paper is presented by Dr. Naby on another panel. Dr. Eden Naby’s paper, Women’s Education in Iran: The Missionary Impetus among Assyrians appears on a panel on American Missionary Activities in the Ottoman Empire and Iran (19th Century). And another coup for Assyrian studies: it is listed as “field of study” by MESA for the first time. As long as MESA members indicate Assyrian studies as one of their fields of academic interest, this field of study will remain active. Perhaps soon, there will also be a geographical entity like “Assyria” listed as there has been a “Kurdistan” since 2004. 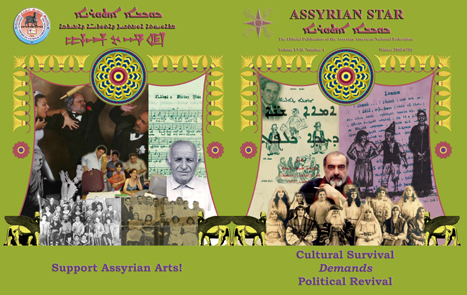 Special thanks go to the Assyrian Star magazine where the above article will appear in the Spring 2006 issue.